Performance Sentry VM™ provides the bridge you’ve been looking for to finally incorporate your VM performance data into your existing Windows performance monitoring and capacity-planning infrastructure. Use Perfmon to view real time performance of your Host and Guest machines. 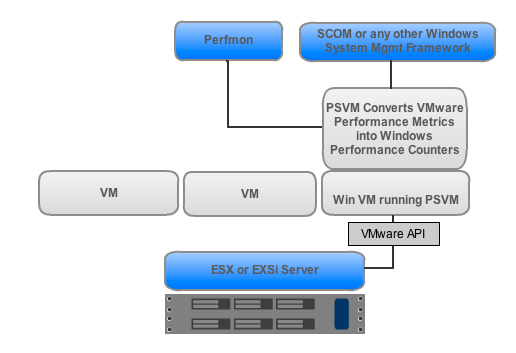 Performance Sentry VM works as a “provider” of VMware performance metrics by requesting metrics from the ESX or ESXi host for both the host and all of the guests running under the same host. Those metrics are then formatted to the object / counter Windows performance data structure. Because Performance Sentry VM is a vendor neutral product, data is made available for consumption by products like Microsoft System Center Operations Monitor (SCOM), Perfmon and of course our Performance Sentry as well as most other Windows performance monitoring tools. Performance Sentry VM doesn’t require you use new reporting tools to view real time data on your systems. Because it converts VMware performance metrics to the standard Windows Objects and Counters you can use existing tools like Perfmon to view the real time performance of any of your host or guest systems. If you have other tools for viewing real time Windows performance information you can use those tools to view, monitor, collect, aggregate and report your VMware system performance data. Performance Sentry VM can collect and report on over 350 counters from 24 different objects. That volume of information makes troubleshooting problem systems significantly more manageable than using snapshot solutions like esxtop. For more detail see the complete listing of the objects and counters collected by Performance Sentry VM (pdf). The Performance Sentry VM Management Pack for System Center Operations Manager (SCOM) enables collection and charting of the most pertinent VMware ESXi performance data exposed by Performance Sentry VM. VMware ESXi performance data is organized at the summary level, host level, and guest level for all Virtual Machines. See an overview of the Performance Sentry VM Management Pack in the video to the right or view it here. Demand Technology has been known for years for efficient performance data collection and that expertise has gone into the design and development of Performance Sentry VM. By requesting data directly from the source and operating from any Windows guest running on ESX or ESXi Server there is no need to “round trip” through vCenter to gather performance information. This highly efficient method of requesting performance data eliminates the possibility of latency and allows you to correlate performance data more accurately. Performance Sentry VM is a trademark of Demand Technology Software, Inc. All other trademarks are the property of their respective owners. Click on the video below for an overview of the Performance Sentry VM. Click on the video below for an overview of the Performance Sentry VM Management Pack for Microsoft System Center Operations Manager.